Recently, I had a conversation with Chris S, a vintage stuff collector who told me that he'd never had an HP LX because of the (in)famous problems with hinges. To calm his worries, I promised to come with a link to a great source of all-things-HPLX knowledge. Here it is: an article about how to repair broken hinges, latches, displays and keyboards, and how to prevent future hinge problems - at Hermocom. I’m still using my 200LX. Why? Because it’s a PIM, an engineering tool, ebook reader and data acquisition device which can be charged once per monith, not per day as today’s devices and it works with standard AA batteries available everywhere, so they won’t disappear next year forcing me to replace computer. 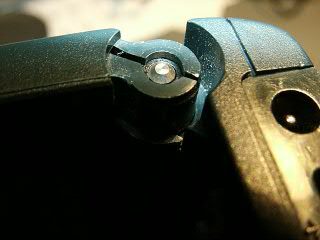 The best way with LX’s hinges is to prevent. The biggest question when lubricating hinges is “how loose they should be to prevent crack?”. There’s quite simple measurement indicating it. If you leave palmtop opened ca. 125 degrees, it should open itself gravitationally so slowly that the cover will move by ca. 1cm in 10 minutes. This is a compromise between usable hinges and crack prevention. P.S. Dobrze słyszeć, że w Polsce jeszcze ktoś poza mną interesuje się DOSowymi palmtopami :). Thanks for your advice. People, more of such comments! Jakbyś miał jakieś pytania co do LX’a to pytaj śmiało. W razie czego mam na swojej stronie kilka poradników dotyczących LX’a.